The aerodynamics range is used for the teaching of a vast range of aerodynamic principles, from fundamentals through to advanced theories. Subsonic wind tunnels teach students the basics about lift, drag and pitching moments, plus the high-level topics such as the boundary layer and pressure distribution around models. Students can also perform wake investigations. Supersonic wind tunnels are for the more advanced teaching of aerodynamic engineering, with experiments that start with nozzle pressure distribution, on to analysis of Mach numbers, and the measurement and visualisation of pressure and shock waves using Schlieren apparatus. The comprehensive range means that a product can be found to suit every space, budget and complexity requirement. The wind tunnels available span a variety of sizes and experimentation capabilities, from bench top models for learning the basics to products requiring large laboratories for more detailed understanding of aerodynamics. 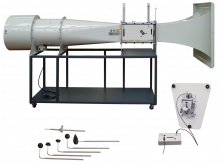 An open circuit suction subsonic wind tunnel with a working section of 300 mm by 300 mm and 600 mm long.